Come stay with us a Whispering Acres: Here is a very comfortable 3-bedroom (1 king, 2 queens, a queen sofa bed and additional bedding when needed) 3-bathroom home with 2 huge living rooms (upstairs and downstairs) in legendary Livingston, south central Montana (fly-fishing capital of the U.S.) This home is extraordinary for being in a remote area, yet with urban conveniences. It sits on 20 acres, with its own private pond, and is only 1 mile from an Albertson's supermarket and 4 miles from historic downtown Livingston. It is also 4 miles from the closest fly-fishing point on the famed Yellowstone River. Access is easy. Interstate I-90 is conveniently close and you are 28 miles from Bozeman Gallatin Field's (BZN) national airport, or a two hour drive from Billings (BIL) airport. The home is privately owned and not managed by an agency! 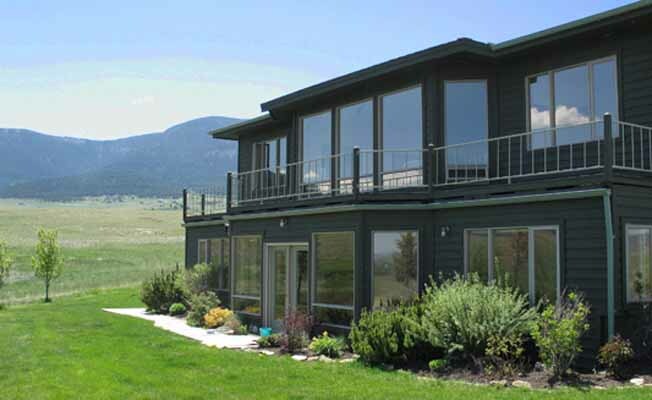 For more details, see: www.whispering-acres.net 'Whispering Acres' amenities: Upstairs in the house, is a vast living room with huge double-pane windows allowing spectacular views from the 'Absaroka Mountains' to the 'Crazy Mountains'. There is comfortable western-style leather seating and a flat screen TV, wifi throughout the house and a vast collection of DVDs. Off the living room is a bedroom with a king size bed and a full bathroom behind it. On the opposite side is the dining area and kitchen. A stairway by the front door leads downstairs where a queen size sofa bed sits in the den and 2 bedrooms, each with a queen size bed (one has a genuine Tempur-Pedic foam mattress) allow for more sleeping. Each has its own bathroom. Additional bedding is available in the house if necessary to accommodate up to 10 people. Access to and from the 2-car garage with remote-controlled electric doors is through a living room door. A laundry room adds to the comfort of your vacation. Cooking at 'Whispering Acres': The kitchen is open to the dining area and great room, and has a wonderful view out the windows. A door opens to the large deck. We have fully stocked the kitchen with place settings, flatware, glasses, mugs, stemware, all cooking utensils, pots and pans, baking dishes, and all kitchen 'tools.' Of course, there is also a dishwasher, refrigerator-freezer, island stove-top, double oven and broiler, microwave, toaster, coffee pot, blender, and waffle iron. Ski: Bridger Bowl, Montana, is the gem of the Northern Rockies. Located only 45 minutes from the house, this outstanding ski area is well known for offering some of the most exciting ski, snowboard and telemark experiences that you will find, anywhere. This is not your typical Montana ski resort. Bridger Bowl is a nonprofit community ski area offering a great ski experience at an affordable price. Close-by Bozeman is home to Montana State University and is a young active community located only 25 miles from house.